A library of 95 potential Sigma-1 and Sigma-2 inhibitors was swiftly generated taking advantage of the parallel synthesis capabilities of MiniBlock XT. 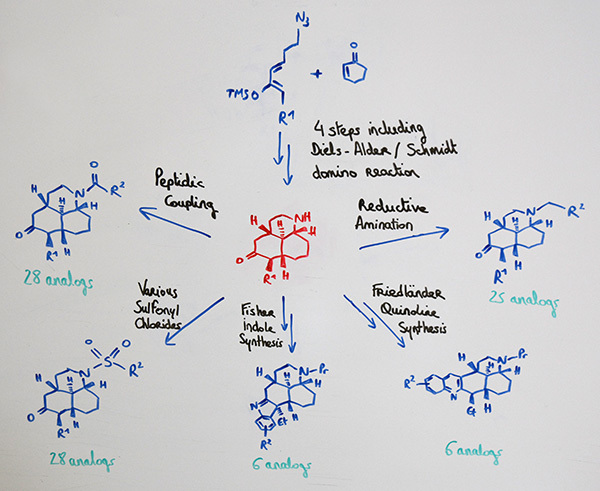 An elegant and divergent synthesis scheme was designed to prepare a series of analogs of potentially bioactive compounds. A 6,6,6-tricyclic amine building block was prepared through a Diels-Alder cycloaddition/Schmidt rearrangement domino sequence. Taking advantage of the MiniBlock XT unique capabilities in parallel synthesis, this scaffold was derivatized into 5 classes of analogs, for a total of 95 novel compounds. These structures will be screened against the Sigma-1 and Sigma-2 receptors to determine their biological activities. 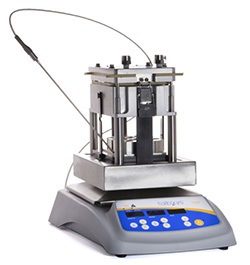 The SiliCycle MiniBlock XT is an easy-to-operate parallel synthesis system designed for synthesis and screening reactions. 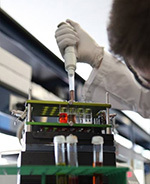 Applications include synthesis of small organic molecules, optimization of critical process parameters, and screening for optimal reaction conditions.